The southernmost subspecies, the quagga (Equus burchelli quagga) of South Africa , is also extinct. It occurred in large numbers south of the Orange River at the beginning of the nineteenth century, but Boer settlers decimated the population for meat and hides. 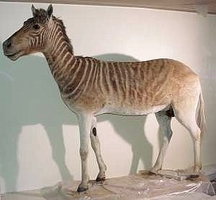 The quagga disappeared from the wild by 1878, and the last zoo specimen died in 1883. All that remains today are nineteen pelts, a few skulls, three photographs and a few paintings. The quagga was yellowish-brown with stripes that were confined to the head, neck and forebody. DNA from one of the pelts has been retrieved and analyzed, establishing that the quagga was, indeed, a variant of the plains zebra and not a separate species as previously believed. There is currently an experimental breeding program in progress in South Africa to try to reconstruct the quagga from the Chapman's subspecies.